In the last installment on this Coyote project, the engine was on the dyno at Westech Performance in California with a Holley HP 750 carburetor and Rich Groh Racing Engines sheetmetal manifold on top. With 34 degrees of total timing, the engine cranked out 574.5 horsepower and 432.3 lb-ft of torque on 116 octane race fuel. Subsequently VP Racing Fuel’s Q16 oxygenated fuel blend was added to help the engine pump out a whopping 590.4 horsepower and 447.3 lb-ft of torque when all was said and done. The engine’s back with a swap to electronic fuel injection, thanks to AEM Electronics‘ Infinity Engine Management System, Ford Racing Parts‘ Cobra Jet intake manifold and throttle body along with fuel injectors from DeatschWerks and fuel-delivery components from Aeromotive. The Carb’d Coyote is no more. Now it’s time to check out the differences between the power levels with the carburetor and fuel injection system in addition to gaining control over the engine’s variable cam timing. Initial testing with in carbureted form had the variable cam timing locked out, but for this test the Infinity provides control over those parameters along with a multitude of other features. Testing took place at CPR Engines in Gardena, California, due to its proximity to the AEM facility and the longstanding relationship the two companies have established. All of the project engines tested by EngineLabs use Driven Racing Oil. The Coyote in this test requires the company’s FR50 5W50 full synthetic oil – it’s formulated specifically for the Coyote’s Ti-VCT system, resists vaporization and foaming, and prevents inconsistent cam phaser system performance. AEM outfitted the Infinity system with a killer software interface called InfinityTuner to assist the end-user in working with specific engine combinations. In this case, they hadn’t addressed any Coyote applications, save for internal testing, so this engine became a test mule. What was expected to be a large undertaking to get all of the pieces talking to one another wasn’t nearly as difficult as initially thought, thanks to the work of AEM’s engineers on the back side. AEM just came out with a plug and play adapter harness that connects between the factory engine harness and a Ford Racing Controls Pack harness, that requires no additional wiring. Some minor adjustments will need to be made to the Controls Pack harness, like swapping wideband oxygen sensor connectors. Also AEM has a universal flying lead harness if you want to make a complete engine harness without the use of the Ford Racing Controls Pack. InfinityTuner works with the tuner to build a base file, where it queries how many cylinders are in the engine, what size the fuel injectors are, the type of crankshaft pickup and other pertinent questions to determine the engine’s operating parameters. “The software is very flexible to handle all of these different parameters. For each application we need to go in and capture the timing pattern, what the cam and crank are doing at specific rpm levels and program the software for that, but as far as the initial timing pattern support, everything was validation after that,” Swartz explains. One of the challenges to tuning (re-flashing) with the factory PCM is that it can’t achieve the rpm levels that this engine will support. The factory limit varies depending upon which PCM is used, whether the car uses an automatic transmission or manual transmission, and which PCM code is used to flash the vehicle – but the max rpm limit is 8,100. Automatic transmission-equipped vehicles are typically limited to around 7,600 rpm with the factory PCM. The Basic Setup Wizard screen asks the user how many cylinders the engine has, the type of ignition, firing order, and other parameters the system needs to know for initial startup. Left - The Infinity is capable of handling many different fuel types - for this test session, E85 was utilized, showing off the system's flex-fuel capabilities. Right - The Infinity ECU uses a flex-fuel sensor in the fuel tank to mix between two tunes. For example, the user would tune with 91 octane, then again for E85, and the system is capable of detecting the ethanol content in the fuel tank and blending the two tunes together to make the most efficient calibration. And it does this all on its own. An engine harness was needed to make the Infinity ECU work with the Ford Racing throttle pedal and other items. “With the Infinity system, we started with the Ford Racing Control Pack and removed the factory PCM, then created an adapter harness to interface between the existing Ford Racing harness and the engine wiring harness for the Infinity, so that you can plug in this adapter harness and the Infinity and you should be off and running. Currently we are looking to produce that adapter harness. The system does come with a pinout document, and a customer can make their own adapter harness at this point,” says Swartz. AEM Engineer Cameron Swartz was tasked with developing an adapter harness to let our Infinity communicate with the Coyote application. During the first run on the dyno, a phaser failed. In this screenshot, note the VVC2B_Duty % at 0 – this means that the Infinity was not supplying any duty to the VVC2B solenoid to move the camshaft, yet the camshaft timing moves on its own to -20.3 degrees. It was through this log that the failed phaser was discovered. It can be viewed on the plot as the purple line. The Infinity ECU provides full control over the camshaft position and can be tuned by the user to advance the intake camshafts and retard the exhaust camshafts, both of which will greatly affect the power production of the engine both in stock and modified forms. “We found that the intake camshafts are able to advance to positive 48 degrees of crankshaft rotation, while the exhaust camshafts will retard to negative 50 degrees of crankshaft rotation, and that’s when it hits a pin that won’t allow the camshaft to rotate any further. We have complete control over the camshafts. The user can drop in some numbers into the system for max horsepower, then they can change those numbers for a cooldown lap to limit the power,” says Swartz. Left - Both Variable Valve Control (Ti-VCT) target tables are shown here (VVC1 = intake, VVC2 = exhaust). Note that while both intake cam sensors are following the target closely, one of the exhaust cam sensors has ceased to follow the target and has been highlighted red by the software to warn the user that the cam is not tracking properly. Middle - This graph shows the VVC1 table, controlling the intake camshafts. Note the 20 degrees of advance after 50 percent throttle application. Right - VVC2, showing exhaust camshaft timing. Here the exhaust camshafts are retarded 20 degrees as throttle position is increased. The company tested the system on a stock engine to determine its capabilities, and they quickly determined that controlling the valve motion during the RPM sweep process brought great returns in the power department. When this engine was tested with the carburetor, the camshafts were locked out and prevented from moving on their own as there was no way to control them given the equipment on that combination. Moving to the Infinity ECU provided the ability to start playing with the camshafts again. It was time to rebuild the VCT system, so COMP Cams’ Phaser Limiters [PN 5493] were selected. These ingenious pieces of metal physically limit camshaft phasing to 20 crankshaft degrees while still permitting maximum intake advance and exhaust retard with the custom-ground COMP camshafts used in this application. The limiters install in the valley between the two halves of the phaser body. Check out this article for more information on how the phasers and Phaser Limiters work. “Basically, when we initially started testing this application on the engine dyno on a stock engine, we started with no advance or retard, and it had some pretty significant lulls in power. From 2,500 rpm to 3,800 rpm it’s a pretty large dip, and then power production begins to increase. We were able to retard the exhaust camshaft to -20 degrees, and past that it started to negatively affect the torque curve,” he says. “Advancing the intake cam came into effect from 3,000 to 5,000 rpm, and we were advancing it about 45 degrees. Both of those camshaft adjustments significantly helped horsepower and torque. It was close to 60 horsepower and 60 lb-ft of torque difference between locking out the Ti-VCT at resting position to a completely tuned product on the other side. It’s pretty significant how much intake and exhaust variable valve control (Ti-VCT) affects this engine,” says Swartz. With the Phaser Limiters in place in this engine, the limitation is 20 degrees of crankshaft rotation, but this is all that’s necessary to build in previously-unseen torque gains by doing nothing more than manipulating the camshaft timing events in relation to crankshaft position. Any more adjustment than the stated 20 degrees with aftermarket camshafts, and the risk of contacting a piston and valve becomes much greater. Although there is control over camshaft movement, these are still mechanical pieces that take milliseconds to operate and the need to ensure than the valves are out of the way of the pistons reaching the top of the stroke remains critical. 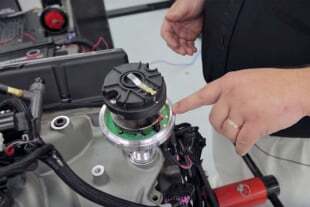 One of the important items on this engine that many other performance engines do not have is its drive-by-wire capability – there is no direct connection between the driver’s foot and the throttle body assembly. The drive-by-wire system in the Infinity ECU allows use of the factory Mustang pedal with the electronic throttle body, and setting up the drive-by-wire system’s calibration is as simple as going through a wizard built into the InfinityTuner software. From there, the Infinity system measures the voltage at the pedal and the throttle body and calibrates the pedal and drive-by-wire throttle plate to move as one. By measuring the voltage at the pedal and the throttle body, it’s able to self-calibrate, and there are several error messages that will pop up to notify the user if the system is not operating properly during the calibration process. Left - Step three of six during the drive-by-wire calibration process. The system walks you through each step. Right - This screen of the Drive-By-Wire diagnostic/tuning info demonstrates the Infinity's ability to define two independent throttle curves. In this example, #1 is a standard linear curve, where #2 is non-linear, and would make the torque easier to control at part throttle. Throttle maps can be switched automatically based on current gear, or with a manual switch on the dash. “Not only is the drive-by-wire setup very simple, but you have complete control over what the curve looks like. You can change between throttle curve maps with a potentiometer. Let’s say you’re out on the track and you’re in position one on the switch, which is full power, and you’re starting to go into your cooldown lap. You can switch over to selection two, which can be full throttle on the pedal, but you can configure the throttle plate to be at only ten percent – you can control how the pedal position relates to throttle position completely on a user-selectable switch depending on what you’re trying to do,” explains Swartz. The abilities of the system far outweigh what is possible using a factory PCM with a typical aftermarket reflash. Many of the parameters that the Infinity can control are not accessible during a typical flash tune, and it’s the ability to control these that makes the system so attractive for use on this formerly-carbureted powerplant. Left - The Knock table shows raw knock voltage measured per cylinder. This knock noise floor can be set independently per cylinder in cases where some cylinders appear 'quieter' than others. It’s also important to note here that this data was gathered from only two sensors, but due to the Infinity’s ability to separate knock noise per cylinder in a user-defined narrow window of crank angle, other noise which is not actually knock is largely filtered out, and can still be easily detected even if only a single cylinder is knocking. Right - This is the VE table in rpm versus throttle configuration. Because the Infinity is a Volumetric Efficiency system with MAP as an integral part of the VE calculation, a throttle based VE table can be used, even on forced induction systems and changes in the manifold pressure are compensated for in the VE calculation. The plot shows both Lambda sensor readings overlaid on top of the target Lambda in grey. With the removal of the sweet sheetmetal RGR Engines manifold, a suitable replacement was required that would work well at higher rpm levels, and for that solution Ford Racing Parts and the Cobra Jet Coyote intake manifold and throttle body were selected. The Cobra Jet manifold fits onto all Coyote engines and is based on the intake manifold used on the naturally-aspirated version of the 2013 Mustang Cobra Jet – in essence, a perfect fit for this high-winding engine. It offers a large power increase over the FRPP Boss 302 intake manifold, while keeping the torque at or above Boss-style power production. 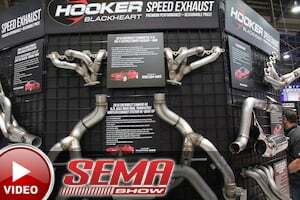 The runners are tuned for 7,750 rpm peak power, and the manifold is built from lightweight composite material. High-winding naturally-aspirated performance is right up the alley of the Ford Racing Parts Cobra Jet intake manifold. Based on the Boss 302 manifold, but optimized even more for high-end power, this manifold is perfect for the high-compression Coyote. The manifold does come with a pigtail harness; the existing Coyote harness needs to be de-pinned and transferred to the Cobra Jet harness. The Ford Racing Parts Super Cobra Jet oval throttle body was chosen to control the airflow into the manifold. It flows a whopping 1,797 cubic feet per minute, which is plenty of airflow for the requirements on this engine. The precision-machined billet aluminum throttle body is fully assembled and comes with a throttle position sensor and actuator motor for the drive-by-wire system to work properly. The next step in upgrading the induction system for use with the Infinity came in the form of a set of DeatschWerks’ matched 60-pound injectors [PN 18U-00-0060-8]. These larger injectors were chosen because the engine will be tested on E85 fuel using the flex-fuel sensor capability of the Infinity system. This gives the ability to blend different fuels depending on how the engine is used – on the strip or at the road course. The injectors are balanced within 1-2 percent and have an optimized spray pattern for smooth idle and tuning characteristics. Fuel injectors are 60 lb./hr. units from Deatschwerks, delivered in a set that’s matched within 1-2 percent and offered with a three-year warranty. The high-flow 5/8-inch Aeromotive fuel rails will handle more power than this Coyote engine will ever make. The last item on the parts list was a new set of Aeromotive fuel rails designed for the Coyote engine. These billet rails [PN 14130] utilize a high-flow design that’s capable of handling enough fuel to support 3,000 horsepower with a 5/8-inch internal diameter all the way through. They fit all 2011+ 5-liter Coyote engines and will ensure a steady stream of fuel is available to each injector with a minimum of pressure fluctuation through the operating range. With the new, fuel-injected configuration on-hand, and the ability to now control the variable cam timing through the Infinity, it was expected heading into the test that a sizable power bump would show up on the CPR Engines dyno. More importantly, the midrange power was expected to increase, and the Infinity didn’t disappoint – but it wasn’t without challenges. The dyno at CPR Engines was flogged extensively over the course of one very long day. Note the additions to the dyno headers – in order to clear the dyno with the headers, a set of six-inch extensions were installed. On the first day in the dyno cell, the engine was pulled along gradually to check the fuel and spark, then the intake cams were adjusted. The day was cut short due to a broken exhaust phaser. Interestingly, the Infinity’s built-in datalogging software discovered the problem before further damage could occur. Although there was no commanded exhaust retard in the tune, the plunger in the phaser was sticking and giving the camshaft the full 20 degrees of timing retard, requiring a replacement phaser to be installed. In a followup session at CPR, the engine was revved to 8,500 rpm with best power of 624.9 horsepower recorded at 7,800 rpm. Peak torque of 462.3 lb-ft came at 6,200 rpm. The engine developed over 400 lb-ft of torque by 4,700 rpm. The left-side dyno sheet is from the carbureted version of the engine, and the right-side sheet is the new Infinity-controlled version of the engine. Look at the large gains in torque across the measured rpm levels. At 5,000 rpm, the fuel-injected engine is up 15 foot-pounds, and that increases to 21 foot-pounds by 6,000 rpm and is carried throughout the rpm range. Horsepower is up as well - 14 at 5,000, 24 at 6,000 rpm, and 34.5 at the power peak of 7,800 rpm. Remember that in the first round of testing with the carburetor, the camshafts were locked solid. The additional gains in power can be attributed to the camshaft control. It carries that number through the torque peak and all the way to the horsepower peak, where it’s still making 420 lb-ft. The engine makes 400 horsepower by 5,000 rpm and keeps on climbing to the peak number with a ton of throttle response throughout the rev range. The Infinity’s capability to run different fuel types by simply inputting the correct information into the InfinityTuner software is a well-received feature; the 650 horsepower mark may have been possible with VP’s oxygenated Q16 fuel but dyno time to make that a reality was in short supply. The fabricated drive-by-wire assembly on the dyno – it’s not beautiful, but it works. The Coyote’s factory engine management system is very powerful, and up until now a suitable aftermarket replacement was not available that offered all of the same features. AEM Electronics’ Infinity system does everything that the factory system does – and more. On the engine for this test, the system allowed AEM’s tuners to substantially improve the performance of the engine with nothing more than keystrokes on a laptop, and make the engine much more user-friendly to operate. The level of control provided for the camshafts and the drive-by-wire system are second-to-none, and the additional control for flex-fuel operation and substantial other features built into the Infinity give it the ability to shine, both on the dyno and in the real world. 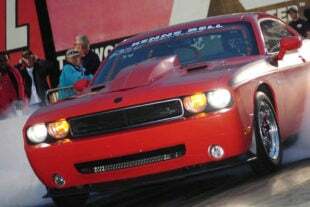 Ray Barton Racing Engines, AEM Collaborate On 800-horse Hemi!